It's been a busy couple of weeks. Sunday, June 8 I went to Columbus, OH for the TNNA show. I'm not a yarn store owner, but when it's a couple of hours away, it's a good time to meet and greet suppliers, yarn suppliers, and other bloggers. I saw Lucy Neatby, the rainbow lady. I talked with Lily Chin, Margaret Fisher, Lynn H. Franklin Habit, Annie Modesitt, Chrissy Gardiner, Joan McGowan-Michael, Helene Rush. Shannon Okey, Kristin Nichols, Jackie E-S, Beth Brown-Reinsel, and Sheila Ernst. I also talked with Chris Blysma of Knitting at Knoon, Katerine Cade of South West Trading Company, Joe Antal of Oasis Yarns, Interweave Press and XRX. It is a trade show after all. I'm hoping to do more designing and teaching in the coming year. I got home around dinner time, and late that night, got on Amtrak for Chicago and then San Francisco. We have traveled by train before. We start at dark-o-clock in the morning, after staying up half the night, because that's when the train comes through. We then go to sleep and wake up in the Chicago area, where we change trains. We take the sleeper from Chicago, so have a nice lounge to wait in and a couple of hours to go outside and see the area near Union Station. Here's a picture of the Chicago River from last trip. It was gray and overcast this time. There had been a lot of rain in the area. Here's the Mississippi as we passed over it. We didn't come back this way becasue of the flooding, but that's a story for another day. We passed lots of farmland . 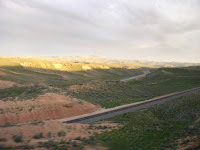 (no pictures) When we got into Denver, we were told that we were going to miss the most spectacular part of the Rockies with the Moffet tunnel because of track work being done. We've seen it before, but still... The scenery can still be boring, but a lot different from home. 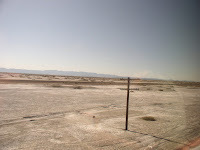 There is bleak desert in Nevada. 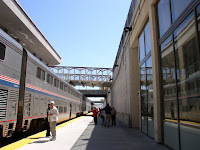 In the Denver station was a piece of railroad history. These cars are called "private varnish." We saw a different private cart last time through. 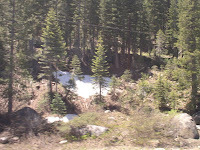 When we got into the Sierra Nevada Mountains, there was still snow. "smoking stop," where you can get off the train, but not leave the platform. 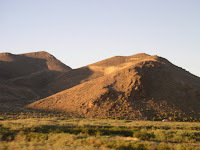 We saw a spectacular sunset in Utah and an equally awesome one in Nevada. 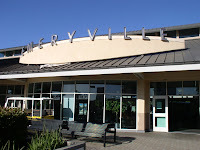 The train portion of the trip ended in Emeryville, CA. We then took a bus across the Bay Bridge to San Francisco. The entire trip took 3 days. 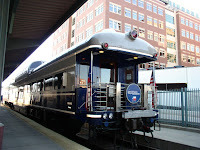 We got off the train late Wednesday afternoon. We had a wedding to attend and family to spend time with. Much knitting was done on a purple sweater. It wasn't finished until the trip home. and still needs a good bath before its formal portrait. I actually packed 5 projects, including 2 pairs of socks. This is excessive for the amount of time available, but actually was a good thing. Just before we left, DH decided to have the 3rd floor of the house insulated. When you hire a professional, he has his idea of the right way to do things. This meant that all plaster and lathe needed to be removed and the "living space" insulated, rather than the roof. We will have plaster board for the walls, damaged plaster will be gone. Unbelievably, 1/4 of all our belongings were moved in a little over 24 hours. A teenage grandson and daughter with strong husband did the work. DH couldn't help because of medical problems and I was at work and TNNA. We have stuff piled in much of the house and in the garage. There is a dumpster in the driveway, so we are a 1 car family for now. My yarn stash is not available! Even many of my summer clothes are buried. The ideal time to tear apart the house is when we aren't there, but even without construction debris it's a mess. Even the dog was a dog camp for the duration.